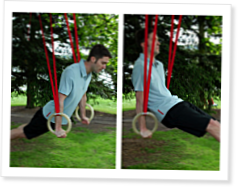 Last month I covered the support position on rings in significant detail. This month, we're going to build on that foundation and look at applications of the support position and variations on it that can add challenge to your training. We will also go into detail on an exercise that regularly appears in CrossFit workouts, the ring dip. First though, let's talk about setting up your rings. I recommend spacing them 50 centimeters apart, which is the official distance. Personally, I don't measure out 50 centimeters every time I hook up my rings. Gymnasts have a clever tool for measuring out the right distance. They call it "your arm"--specifically the length of your forearm from the back of the elbow to the tips of your fingers. This distance tends to work well for most people. I usually add another inch or two, but you will figure out on your own what you like best. In any case, it's likely to be a width that puts the rings just outside your shoulder.